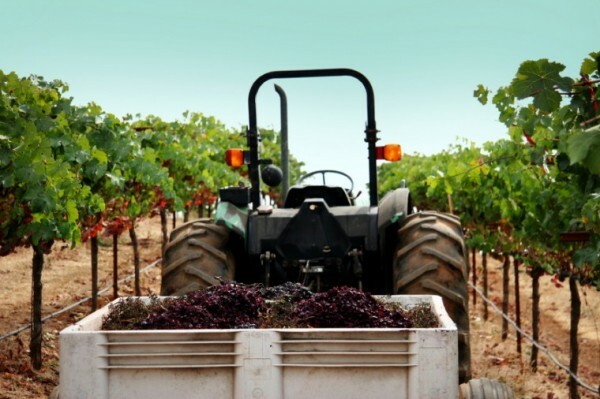 In California, the grape harvest usually begins in late August to early September and could last through November depending on the weather and the type of grapes. Before this point, the grapes themselves have been affected by heat, rain, soil, and intervention by the grower or winemaker. After the harvest, the grapes grow through a transformation; a series of steps that turns a common grape into a complex finished product that goes beyond fermented grape juice. The first step in the process is to crush and de-stem the fruit. This is typically done mechanically in a crusher/destemmer, which performs exactly as it sounds. The stem are discarded leaving a mixture of juice, seeds, pulp and skins, called “grape must”. The skins and seeds give wine tannins, which are polyphenols that give wines that structure and complexity to age. You may experience tannin as a dryness in your mouth with a very young wine whose tannins are still very strong. The grape skins also give red wines their color and some of their flavor. White wine juice has only a short period of contact with the skins and seeds before being pressed to extract all of their remaining juice. Rose wines are made from red grapes when the skin is allowed to have enough contact with the juice to tint the color from white to pink. Once all of the juice has been extracted, it is filtered and prepared for fermentation. In order to being fermentation, yeast is added to the juice and begins the process of converting the natural sugars in the fruit to alcohol. Fermenting can take place in stainless steel tanks or oak barrels, or sometimes both. The winemaker may decide to ferment the wine a second time, called malolactic fermentation, which converts the tart malic acid to softer lactic acid, yielding a creamier wine. Fermentation can take anywhere from three days to three weeks, depending on the wine. Just as wines can be fermented in stainless steel or oak barrels, they can also be aged this way. Red wines are commonly aged in oak barrels for one to two years. White wine does not require as much aging, depending on the winemaker’s desired result, and may be aged anywhere from one week to a year. Sometimes aged wine is blended with other wines to add different characteristics or balance out flavors. Before bottling, wine often goes through a finishing process to stabilize the product, filter out sediments, and prevent oxidation or spoilage.